The Dramatic Living Skipper from the 1970 Sears Exclusive Gift Set #1586 "Very Best Velvet" was made in Japan, and her hair is a lighter shade of blonde. In 1970 #1117 Dramatic Living Skipper and #1147 Trade-In Living Skipper (who was a promotional doll to introduce this new line of doll) was released. Also in 1970 Sears Exclusive Gift Set #1586 "Very Best Velvet" was available too. All the dolls have blonde hair, blue eyes, bendable legs, and a swivel waist. Their arms and hands swiveled as well. 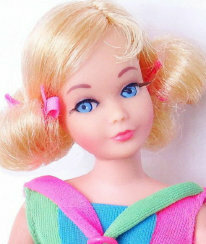 Skipper that was included in the gift set had a lighter shade of blonde hair, and she was the only version "made in Japan". 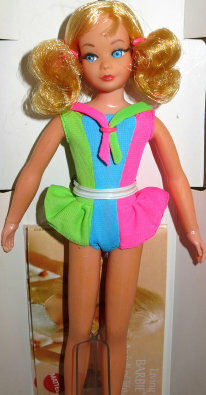 The dolls wear a one-piece blue, green, and pink swim-suit and have two pink hair ribbons tied in their hair. A clear X stand and booklet is also included with the set. There is a yellow dress version of #1117 Dramatic Living Skipper that was released in 1971. Included with the dressed doll is a skate board, stand, and a brand new style box. 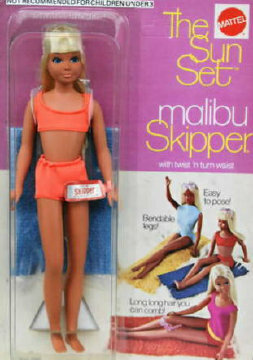 In 1971 #1069 Sun Set Malibu Skipper was available. She has blonde hair and blue eyes. She wears a two-piece orange swim-suit, and the package includes a blue towel, sunglasses, stand and booklet. She is marked: ©1967 /Mattel Inc./U.S. Pat'd./ U.S. Pats. Pend. /Made in Japan. In 1973-1976 her mark changed to "Made in Korea".